When I walked into my kitchen this afternoon, I had no intention of making cheesy crackers. To be honest, I’ve never really considered myself much of a cracker person. I’m definitely more of a chip person, and this recipe is the result of a failed attempt at “homemade Doritos” for the Superbowl this weekend. With most of our friends still experimenting with a Paleo-style diet, I thought a grain-free, non-processed chip might be appreciated for the big game. 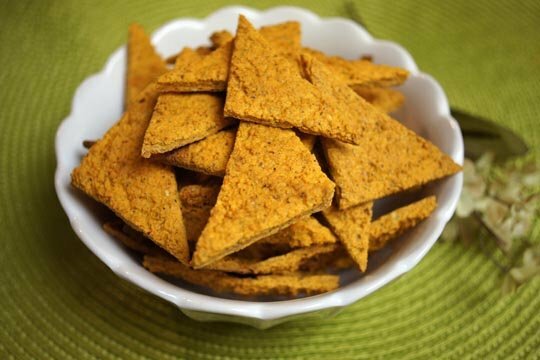 While the result was a far cry from Doritos… I ended up with a bowl of of tasty Cheez-It style crackers! Don’t you love happy accidents? Begin by soaking the nuts in filtered water for at least a couple hours– soaking times vary depending on the nut you use, but I’m not too particular about that– then rinse and drain well. I used a mix of Brazil nuts and raw almonds, because that’s what I had on hand– but I’m pretty sure cashews would work great, too. 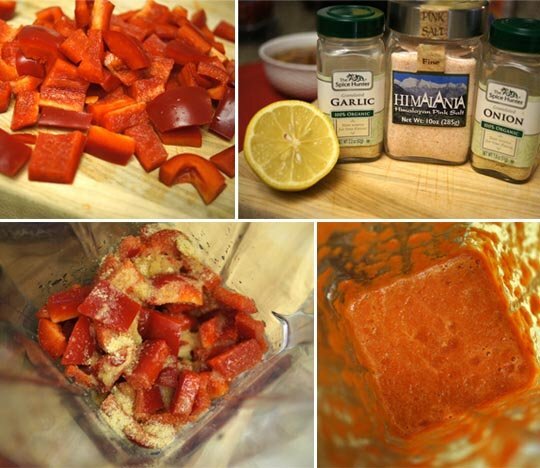 In a high-speed blender, process the bell pepper and all of the seasonings together until you have a smooth, brightly colored sauce. Add in the nuts, and blend again, until thick and creamy. *Note: If you don’t have a powerful blender, you can use a food processor instead, but it may take up to 10 minutes to get a smooth consistency. Transfer the batter to a 9″ x 13″ baking sheet, lined with parchment paper, and use a spatula to spread it out evenly. If the batter starts sticking to the spatula, use wet hands to smooth out the top! 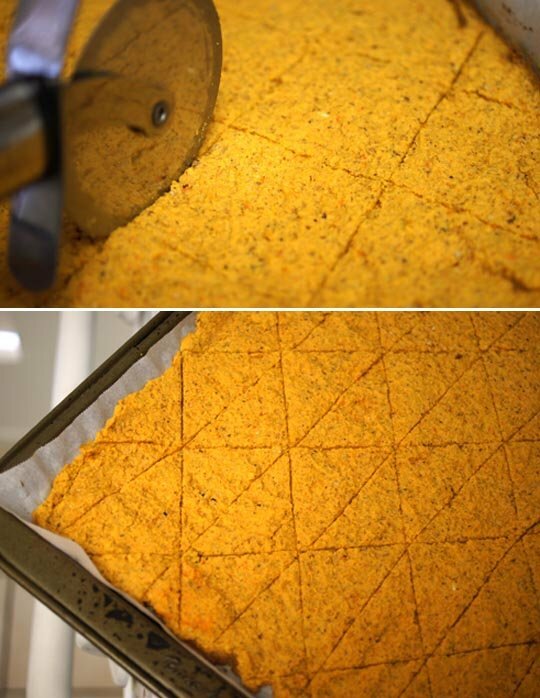 Bake at 350F for 20 minutes, then remove from the oven and use a pizza cutter to score the cracker shapes. 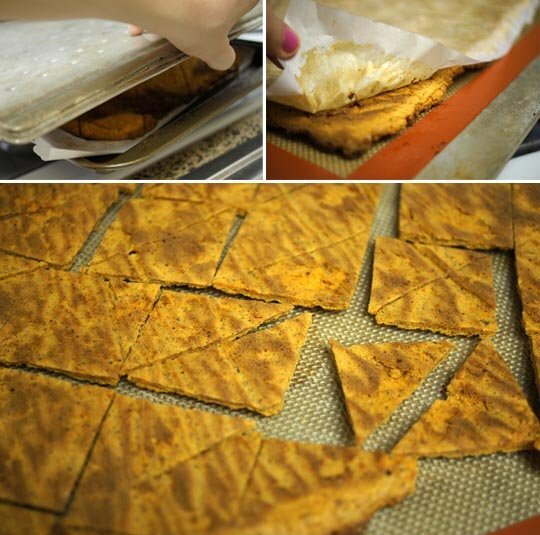 At the time, I still thought I was making Doritos… so please excuse my in-authentic triangle shapes. Next time, I’ll be sure to make cute little squares. Return to the oven, to bake for another 10-15 minutes, or until firm enough to move without losing their shape. Watch closely, as you don’t want them turning too brown! For a nice and crisp cracker, you’ll want to flip them over to bake on both sides. To do this, I simply placed a second pan (lined with a Silpat) on top of my cracker pan, and flipped them over! The parchment paper will come with your crackers, and you’ll need to gently peel it off to bake the bottom sides of your crackers. My crackers naturally separated where I scored them upon flipping, making them easy to work with. Return to the oven for another 10 minutes, or until they reach your desired crispiness. Allow the crackers to cool completely, then serve! These crackers are so loaded with flavor, there’s no need for dip! But, be warned, they may not last long… they’re quite addictive! Next time, I’ll be making a double batch. 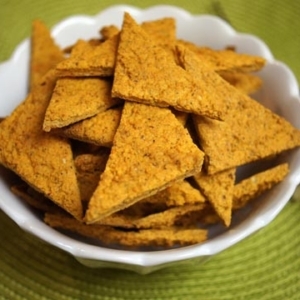 A cheesy grain-free cracker, made without dairy! 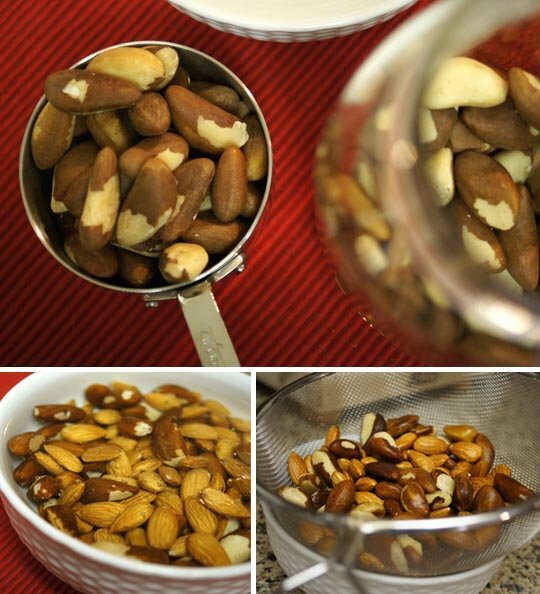 Begin by soaking the nuts in filtered water for at least two hours, then rinse and drain well. In a high-speed blender, process the bell pepper and all of the seasonings together until you have a smooth, brightly colored sauce. Add in the nuts, and blend again, until thick and creamy. *Note: If you don't have a powerful blender, you can use a food processor instead, but it may take up to 10 minutes to get a smooth consistency. Transfer the batter to a 9" x 13" baking sheet, lined with parchment paper, and use a spatula to spread it out evenly. If the batter starts sticking to the spatula, use wet hands to smooth out the top! Return to the oven, to bake for another 10-15 minutes, or until firm enough to move without losing their shape.Watch closely, as you don't want them turning too brown! For a nice and crisp cracker, you'll want to flip them over to bake on both sides. To do this, I simply placed a second pan (lined with a Silpat) on top of my cracker pan, and flipped them over! The parchment paper will come with your crackers, and you'll need to gently peel it off to bake the bottom sides of your crackers. My crackers naturally separated where I scored them upon flipping, making them easy to work with. Return to the oven for another 10 minutes, or until they reach your desired crispiness. By the way, even my 2-year-old niece LOVED these crackers–> so they’re kid approved!! Hope you all enjoy these crackers soon, too! can i use an orange pepper? Thanks you, these just came out of the oven. Delicious. I added paprika and some hotsauce to the mixture. I might try them at 325 degrees next time to dry them out more without browning. YES! I used to have a Cheez-it addiction but since having children, I decided I wouldn’t eat anything I wouldn’t want them to eat. HOWEVER, on occasion, I miss them. 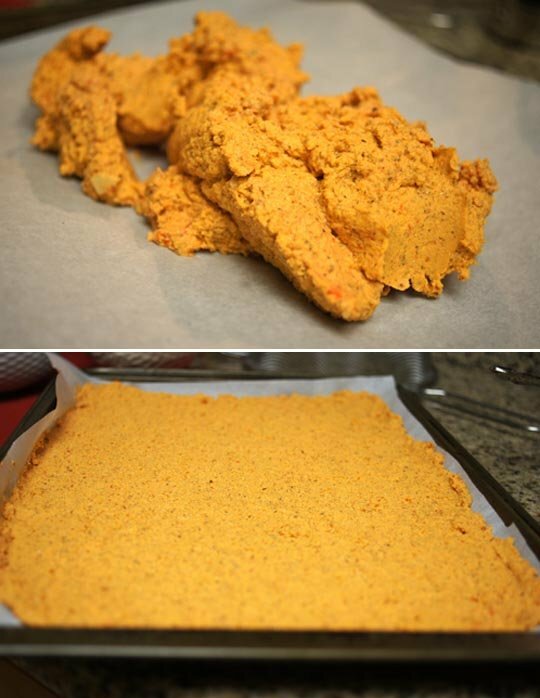 I tried this recipe last week and….THEY REALLY TASTE LIKE CHEEZ-ITS. My whole family loved them and it was great to know they weren’t just eating a processed cracker but rather nuts (I used cashews) and organic veggies! THANK YOU!! If you put them in an airtight container, they get spongy and a little wet. (DON’T FRET…I put them back in the oven and crisped them again.) HOWEVER, once completely cooled, you can make little individual parchment paper envelopes with 8-10 crackers in each and they will stay crunchy and tasty for 4-6 days! I just made these (with a slight variation) as my first kick at making crackers and well I’m not sure if they will make it to a container!! And added 2 tablespoons of dehydrated chives. Can you use almond meal instead of soaked almonds?Thank you. They look great! Could these be dehydrated instead? I’ve been wanting to make these for months, but never seemed to find the time until this past Saturday. Perhaps it’s because I’m a vegetarian, or maybe it’s the fact that I have a ton of food allergies, but I’m one of those people that if I never had to eat ever again I would be very happy. And then I tried these crackers. It was as if I hadn’t eaten in years! They satisfied that specific need for something savory that has been missing in my life. I usually share these discoveries with my gluten-free friends at work, but I “accidentally” forgot to bring these with me. If I could eat these all day every day I would be a very happy girl! Forgot to mention one thing: I used half Brazil nuts and half cashews. Megan these are AMAZING! My husband and I are paleo…and we do find ourselves missing the chips and crackers to dip into some salsa or guacamole once in a while. I made these with your queso dip and some fajitas…perfect dinner. Thanks for a great recipe!! Love these! Turned out great. Even my hubby likes them. Win win! These are simply A.MAZ.ING!!! Thank you. I am looking forward to experimenting and maybe using a yellow pepper and swapping the onions and garlic for herbs de provence or red peper with an italian herb mix!!! Oh and my 3 yr old LOVED them too! Just made these!!!! WOW!! They REALLY REALLY do taste like cheez its!!! I wasn’t even able to use the full amount of almonds because of my wimpy processor, but they still turned out great!! Can’t wait to let my boys try them, hope I don’t eat them all before I let them!! haha! It didn’t turn out the way they should’ve been, because I was in a hurry and I used only almonds, but…..THEY WERE STILL AMAZING! So delicious! Thank you for the recipe! Made these today using 1 1/4 cup almond flour and 1/4 cup golden flax instead of the nuts (reduced baking time). Sprinkled some coarse sea salt on the top when I scored. Amazing. Best cracker I’ve made so far. Did u just made it using the ingredients u mentioned above or u also added the remaining from megan’s recipe (the red peppers plus other ingredients). I just thought I would to try without the nuts. I just made these using the almonds and they are delicious. I didn’t use the yeast, but will next time. I had 2 friends taste them and they asked for the recipe. I’m going to double the recipe and use 1 red and 1 green bell pepper with fresh onion and garlic to attempt to make a pizza dough. I like the thin crust. I won’t cook it as long, so it isn’t as crunchy. I tried the cauliflower pizza crust and it crumbled. Any thoughts on using squeeze dried almond pulp (from making almond milk) as opposed to the actual nuts ground up? I’d love to know if that works, but I haven’t tried it myself, so I can’t be sure. Please let us know if you give it a shot! WOW I’m totally blown over by the quality of the recipes on here. You are making healthy eating an absolute breeze for everybody that finds you. I’ve created so many of your sweet treats at the weekends and they are amazing. Its my birthday this weekend so for friends i’m going to create some of your dips for starters followed by the cauliflower crust pizza and then the courgette cheese cake. I wanted to ask for this recipe could i use ground almonds as a substitute? Almonds may change the flavor a bit, but I bet it will still be tasty! Do you have to use the nutritional yeast? Can you make it without? and is there a reason why none of recipes have the caloric intake and breakdown of nutrition? I’d love that! 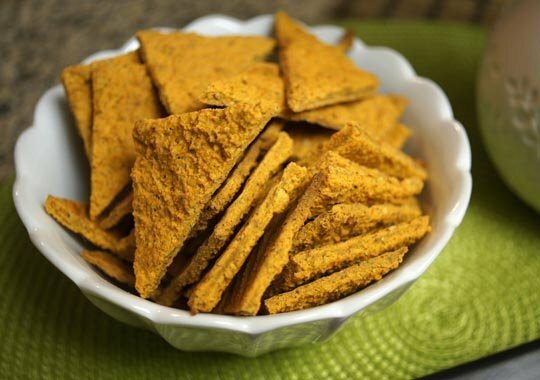 Nutritional yeast contributes the “cheesy” flavor, so if you leave it out, the flavor will definitely be different. I don’t provide nutrition information because I prefer to emphasize eating quality, whole foods, rather than calorie counting. However, you can definitely calculate the information you need using a free website, like Fitday.com, and entering all of the ingredients in any recipe, then dividing by the number of servings. love this recipe but wondering how you think it would work with a dehydrator, thereby keeping the ingredients’ nutrients and enzymes intact? Might try this and let you know how it comes out…. Just come across your blog-love the way you eat with low/no grains! Any tips for a vegan who wants to adopt this diet? My BF and I made these last night and while they weren’t as beatiful as yours turned out, they were really awesome tasting. What a great idea, and they’re so healthy! I will have to make this in the near future, thanks for the recipe! YUM! We are with Amber, we have been enjoying brazil nuts daily! YUM! I’ve been eating Brazil nuts every day (my thyroid needs the selenium) and these sound like a DELICIOUS way of getting my fix! You my gorgeous friend are amazing, thank you for ANOTHER fab recipe!! I need these for my late night snack attacks when I’m watching a movie 🙂 Swoon! Looks so good. Man, reading all these great foodie blogs always makes me hungry 🙂 Thanks for the awesome ideas. Awesome!! I’ll definitely have to try these soon!! Ooh- those sound great! My kids love cheez-its so this will be a great option for them; and they look lovely to me too- maybe with some creamy goat cheese on top?